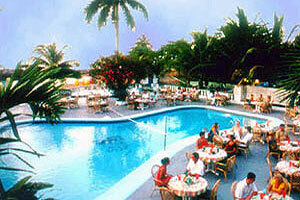 Golden Seas Beach Resort is located just a 15 minute drive from Ocho Rios, and walking distance from James Bond beach. This resort offers competitive rates for its beautiful views and private beach, with quality service second to none. Uniquely situated beside a river that empties into the sea, Golden Seas' main appeal is its seclusion and peaceful atmosphere. Activities and facilities abound however, for the active vacationer. So whether you want to play a game of tennis, enjoy an invigorating workout at our gym or simply laze the day away on our secluded private beach, Golden Seas Beach Resort has everything to make your holiday enjoyable.